Comic book adaptations are a hotspot in Hollywood today, but word on the street is, few people actually knew Whiteout was based on a comic. As always with comic book adaptations, I can go write at length about the differences in story between the comic and the film, but it’s pointless. If you’re going to see the film instead of spending the time reading a real comic, that’s what you’re going to do. Similarly, if you’re going to scoop up the book before you bother with the movie, then so be it. Sadly, too many of you are just going to hit Wikipedia to see if either of them are worth your time. In shortest terms possible, Whiteout is a murder mystery set in Antarctica. An exciting premise, if I may say so. Relatively original, and the possibilities with the setup are endless. There’s a plane crash, there’s a bloody murder, and there’s a small conspiracy, and all in subzero temperatures. The payout could be perfect. And you know what – the comic book pulled it off spectacularly. But the film just has too many problems working against it to gain the same success as the book did. The actual story roles out in a fashion similar to flash cards; there’s an event, a little bit of exposition, and another event. Instead of working evenly, creating a balanced model, it just totters unsteadily as it tries to cope with whatever plot strands its trying to juggle. This seems especially choppy in scenes where Beckinsale’s character grapples with her past, as present-tense events cue sepia-toned flashbacks. The effect just comes out choppy and forced, leaving the audience annoyed. The film is riddled with blank periods void of action. I assume this time is supposed to be used to build tension and skillfully thread along each clue. The problem is, there are relatively few clues, the mystery plays out like a bad episode of Scooby Doo, and these blank periods tend to, instead, tempt the viewer with the possibility of drifting off to sleep. As far as mystery goes, the film is an epic failure. I’m usually one to be able to look past bad acting if the story is good enough, but the acting in Whiteout is just too bad to ignore. 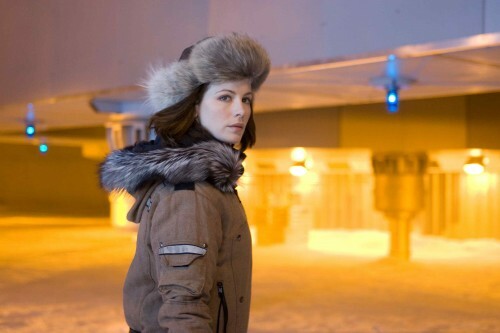 Kate Beckinsale plays one of the most unconvincing strong female leads I’ve ever seen. She reads her lines with all the conviction of a spitting llama and carries herself in the film to match. As far as I can tell, she’s really only going through the motions and waiting for a paycheck to land in her pocket. Her costars, Gabriel Macht included, don’t put out much more of an effort. It really seems like all these guys were just doing what they had to do, no one seemed particularly thrilled to be in their roles, nor did they seem that interested in the movie itself. While I was glad to see Tom Skerritt in a movie that isn’t a Stephen King adaptation, even he performed about as well as a shadow puppet. Most of the movie was filmed beautifully: cool snow flurries and pan shots of planes coasting over arctic tundra always put me at ease. But the director missed out on a lot of great shots had he utilized better lighting or camera angles, especially in those scenes shot out in the snow. Even his action sequences get boring after ten minutes of the exact same shot lineup. Throw in some variation and use some spot lighting during those flurries and see what a wonder it can be. If you’re into murder mysteries, you might as well check the movie out. Like I said, it’s a pretty original idea, and while the payout may be a bit weak, you’ll definitely see some things you like. But if you’re really interested in getting the whole story, do yourself a favor: dip into a comic book store and get the book instead. It’s more worth your money and you can always sell it back if you don’t like it.